TYLER HAMILTON HEARING UNDERWAY. 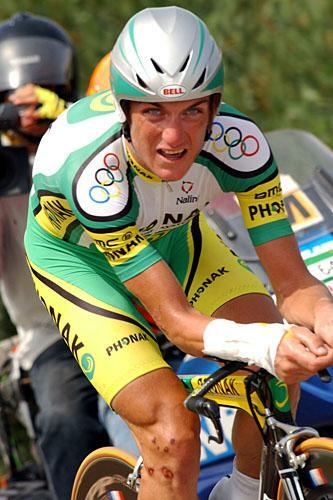 American Tyler Hamilton--the 2004 Olympic champion, former lieutenant for Lance Armstrong, and a top Tour de France contender--has three days to prove he is not a doper. In a special hearing before anti-doping authorities in Colorado, Hamilton will try to prove that a new test administered on him following the Olympics is not valid. It indicated that he had had a recent blood transfusion (a disallowed practice that would have given him a higher blood oxygen level--and more power--than competitors). Hamilton denies ever having had a blood transfusion or using performance enhancing drugs. Hamilton had never failed a drug test until August 2004. If he wins his case, Hamilton will likely be restored to professional bicycle racing and contend for the 2005 Tour de France for Phonak Hearing Systems. If he loses his case, a 2-year ban will stand and, with his age, he may never be competitive again. Follow this story at www.cyclingnews.com.